Stewardship is sacrificing in the present to protect the future. The complaint asserts that both licencees (KLC and ATCO) are not meeting the government’s Community Watershed objectives, or the strategies of their own FSPs. This is in part because the assessment that they are accepting as having met the requirements of their strategies is incomplete, outdated, and by the author’s statements, does not meet its own objectives. Under the management system of professional reliance, both licensees agree that the Apex report is satisfactory for their FSP strategies and is valid for a 10-year span. The community of Glade feels that there are a number of serious concerns about the report, including new information not included in the report. AND: We proceed with Legal Action! 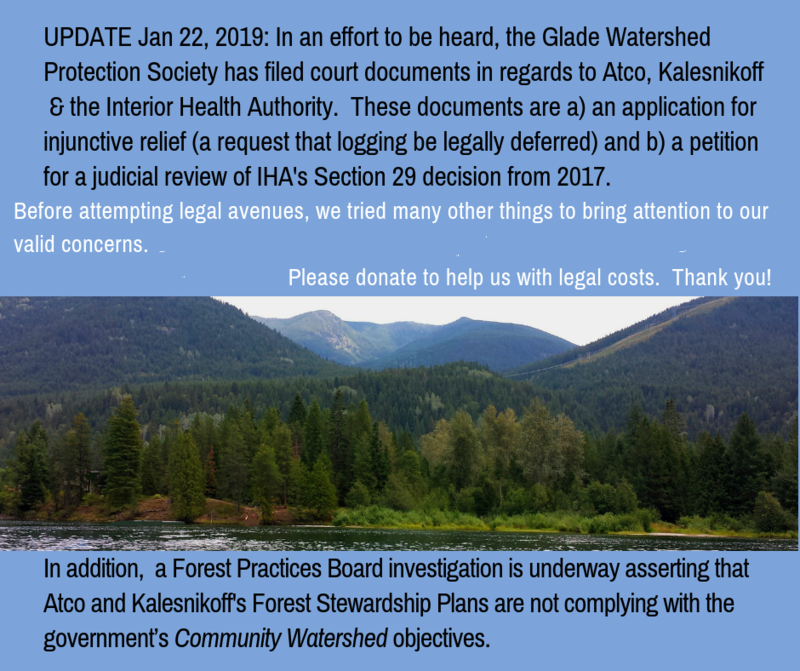 In an effort to be heard, the Glade Watershed Protection Society (GWPS) has filed court documents which were served to Atco Wood Products, Kalesnikoff Lumber Company, and the Interior Health Authority Tuesday January 22, 2019: these court documents are an application for injunctive relief and it is scheduled to be heard on February 4, 2019. The injunctive relief is a request that logging be legally deferred until the Judicial Review of the IHA’s decision has been made, and/or until the Forest Practices Board Investigation is completed. Our lawyer, Lilina Lysenko was the first to speak. She called for “a cautionary approach - time, before logging commences for the forest to be properly assessed by a possible revisit of Section 29 (initiated by the GWPS) and for the Forest Practices Board investigation to be finalized.” Ms Lysenko asked for an injunction to defer logging until investigations have been finalized. She was arguing that irreparable harm would be done to our water and our community if logging went ahead. Glade WPS believes that before clear cutting begins in the Glade watershed there needs to be a true assessment of possible impacts especially as it relates to the quality, quantity and flow of water in Glade Creek, the source of Glade drinking water. Whereas the Apex professional reliance report, commissioned by ATCO and KLC in 2016 gives the go ahead to cut timber; due to a lack of water data that report is incomplete, flawed by omissions, and is an unsound blueprint for road building and clear cutting in our watershed. The hearing lasted for over 3 hours on Monday and Justice Tammen gave his decision on Thursday, Feb 7 at 9:15 in the Rossland courthouse. Decision Dismissed! Justice Tammen laid out the background and arguments by the lawyers, which led him to his decision of dismissal. And although we have received nothing in writing yet, Kalesnikoff’s lawyer asked for damages. The GWPS has held public meetings in our community, we hold weekly GWPS meetings (everyone welcome), update the community by various means, updated and interfaced with the Glade Irrigation District (GID), and created an online Avaaz petition, and organized and held Glade Markets to encourage community involvement. Organized letter writing campaigns: one was about our concerns to KLC’s draft FSP, another was to IHA (134 letters) to support our s.29 submission, another petition was sent to both licensees stating our objections to conventional logging. A Community Questionnaire was organized and collated. A s.29 investigation under the Drinking Water Protection Act was submitted to Interior Health Authority in relation to the proposed logging in Glade Creek (2016). After a year the IHA decided there ‘wasn’t enough evidence’ to initiate a s.29 investigation. In addition to GID water data collection, the GWPS initiated more data collecting on Glade Creek. Costs for this work are supported by GID and GWPS. When asked if development could be halted until we had collected the relevant data that is missing from the hydrologists report, the licensees refused. Have held meetings and written numerous letters to our regional, provincial and federal representatives for their support. We worked with MLA Conroy to try and secure an application for a Community Forest, based on the principles of an Ecosystem based conservation plan. Interfaced and communicated extensively with licensees, attending all meetings and attending three field trips; one with KLC and two with Atco. Papers and submissions were sent to the government. I.e. a 29 page discussion paper to KLC and ATCO and government officials and a Professional Reliance Review document. All of these documents are available for review and are on our website. The GWPS asserts that both licencees (KLC and ATCO) are not meeting the government’s Community Watershed objectives, or the strategies of their own FSPs. This is in part because the assessment that they are accepting as having met the requirements of their strategies is incomplete, outdated, and by the author’s statements, does not meet its own objectives. Under the management system of professional reliance, both licensees agree that the Apex report is satisfactory for their FSP strategies and is valid for a 10-year span. The community of Glade feels that there are a number of serious concerns about the report, including a limitation of water monitoring data, the fact that due to a landslide the report it is now outdated, and historical data has not been included. The GWPS met with the District Manager of Forests in an attempt to get that public office to advocate on our behalf to defer logging until sufficient water data had been collected to inform the community of the actual state of our water. The Glade Community Watershed in West Kootenay is slated for logging now, with licenses being held by two companies. There is no time to wait as trees are being cut in many Community Watersheds and more are slated for logging. Contracts are in place and roads are being built. Community Watershed groups have no legal voice, no legislated processes that have meaningful impact. There is no reasonable means to hold forest professionals and government agencies accountable for their damage to watershed. 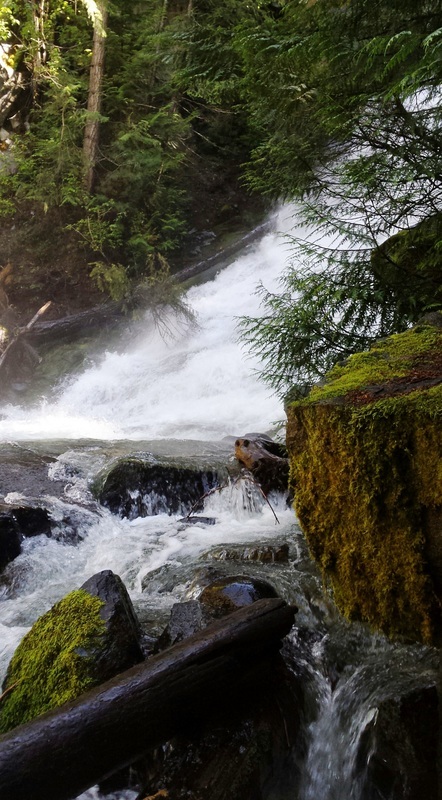 The history of legislation of BC water tells a story of industry gaining control of water and trees as commodities, leaving water users responsible for damage inflicted through industrial activity in Community Watersheds. This has to stop now and it is you and I who will do it. Our message is simple and clear: An Immediate Moratorium on Industrial Logging in BC Community Watersheds. Citizens of BC have the right to clean, safe water. And in order to have that, we need to protect the forests that help to produce and protect the water. When you recognise uncertainty, you recognise that you may be able to influence the outcomes – you alone or you in concert with a few dozen or several million others. 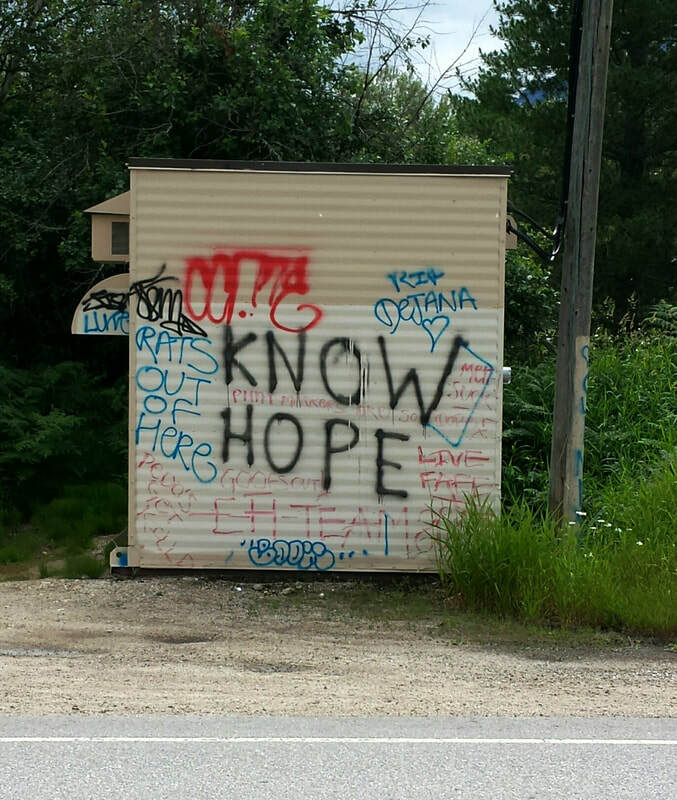 Hope is an embrace of the unknown and the unknowable, an alternative to the certainty of both optimists and pessimists. Optimists think it will all be fine without our involvement; pessimists adopt the opposite position; both excuse themselves from acting. You can write, phone or email Kalesnikoff and ATCO with your concerns! You can think of a fundraising idea for the Glade Watershed Protection Society, you can organize a fund raiser! You can write to the government: Ministries of Health, the Environment, Lands and Forests etc. 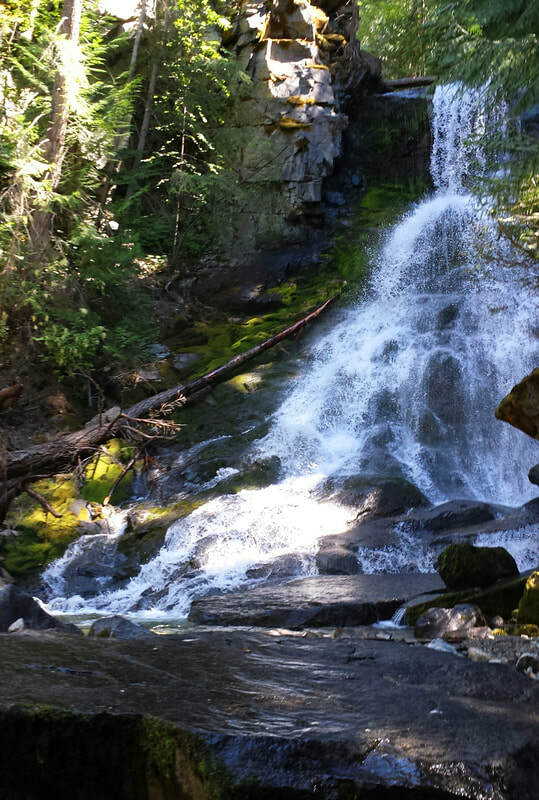 Like our Face Book page for Glade Watershed Protection! You can make a YouTube video! Are you familiar with hashtags or Instagram? 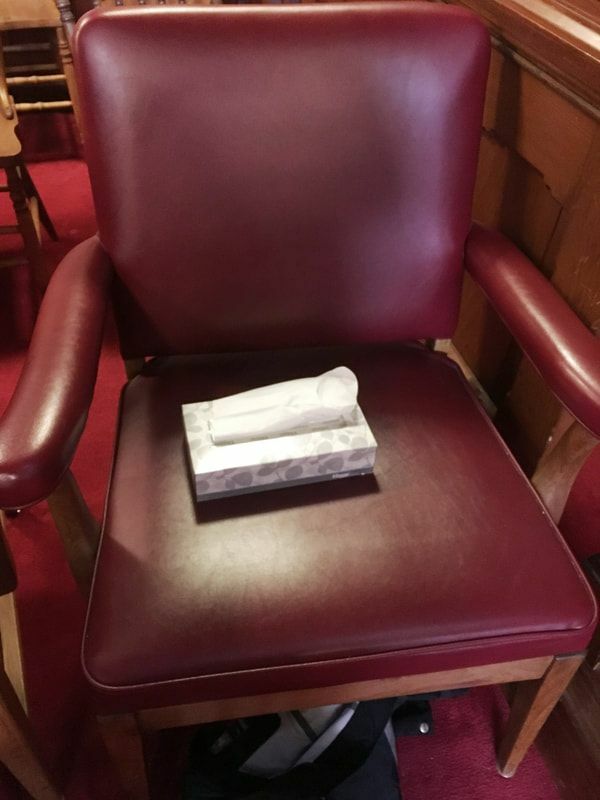 Can you think of a way it might be useful to us?